Located at 1289 Natural Bridge Road in Slade, KY it is a family owned and operated business. Ran by Powell County locals, they proudly offer area info and support local every chance they get. Their gift shop is filled with local artisans and small businesses. They specialize in Tex-Mex food but offer the American favorites as well. Fresh made chips and salsa are served with every dine-in and carry out order. One dish you won’t find on the menu at other area Mexican restaurants is the HillBilly Quesadilla. Served on a 10-inch flour tortilla, this thing is HUGE! So what is it you ask? Quite possibly the best thing we’ve had at a restaurant in Red River Gorge. 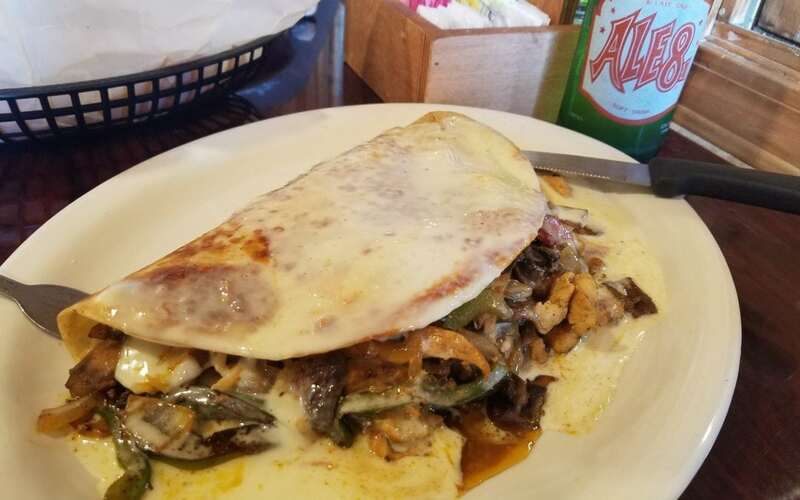 Stuffed inside the tortilla you will find grilled chicken, sautéed onions, bell peppers, mushrooms, and rice. It’s grilled to perfection just before being smothered in an enormous amount of queso. Follow their Facebook page for the latest news and updates. Rumor has it, they will be serving local craft beers, drafts, and frozen margaritas soon.